View Cart “SAGE MASSAGE OIL” has been added to your cart. It is a natural herbal deep cleanser which gently lifts away dirt and other impurities leaving the skin soft, clean and healthy. It is fungicidal and skin nourishing as well . Ocimum Sanctum in Wet Face Pack (Glow Pack) has anti inflammatory properties. Hence, its external application on swollen parts helps to diminish swelling and pain. It helps to reduces pain and scars. It is effective in skin rashes and itching. Curcuma longa possesses anti-inflammatory and anti-bacterial properties. It improves skin texture and complexion. Rubia cordifolia is specially advisable in skin ailments such as pimples, acne, freckles and discoloration but it can also used for gaining luster or glow of the skin. Bentonite is a natural cleaner & astringent. It cleans the skin while maintain the natural balance of skin oil. Almond oil is the best natural cleanser. It cleanses all types of skins regardless of their types. Glycyrrhiza glabra in Fairness Lotion is a source of glabridin component which possess very powerful hyper-pigmentation vanishing qualities. Solanum tuberosum extract is an antioxidant, a sun protectant, a cell metabolism stimulant and an inflammation inhibitor. Allium sativum in Garlic Ointment is rich in antioxidants, which help destroy free radicals (particles that can damage cell membranes, interact with genetic material and possibly contribute to the aging process). Free radicals occur naturally in the body, but environmental toxins (including ultraviolet light, radiation, cigarette smoke, and air pollution) can also increase the number of these damaging particles. Antioxidants neutralize free radicals and may reduce or even help prevent some of the damage they cause over time. Allium sativum has been used successfully for a variety of skin disorders, pimples disappear without scar. Even very persistent form of acne, suffered by some adults, has also been healed with allium sativum. The external use of Allium sativum helps to clear the skin of spots and pimple, and boils. The Aloe vera is unique for its importance in natural skin care. Aloe vera contains burn healing effects, anti-i nflammatory properties, scar reducing properties and wounds. 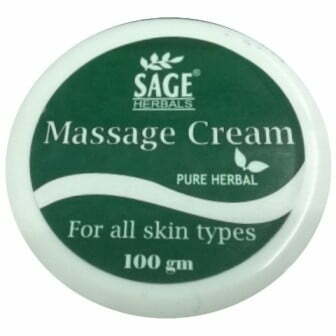 Sage Massage Cream is a pure herbal massage cream. Nourishes and tones the skin. Keeps the skin away from dryness , wrinkles, patches and dark spots if used regularly. Application: Massage the face gently in upward circular motion for 10 to 15 minutes. Sage Massage oil is ayurvedic complex as blend of essential oils that take away all your stress and let you unwind, in the true sense of the word. Allow the soul-soothing coming together of aromatic herbs in the sage massage oil to tantalise your senses as you close your tired eyes and escape into a blissful world devoid of any worries. soften heals dry skin especially for hands, Face, Elbows and Knees that requires intensive moisturising. Neem Face Wash is good for dry & normal skin. Also helps to remove acne & pimples. Sage herbals Pore Tightening Toner helps in refreshing pore tightening and purifying lotion brings the complexion into perfect balance and helps keep skin in its purest state. Sage Herbals Sun power lotion, daily Moisturiser, Dermatologically tested, with aloe vera , helps to prevent skin darkening, premature Ageing & UVA+UVB Protection. Under eye Gel,for all type of skin,with cucumber and mint, removes dark circle puffness, loose skin, Gives beautiful eyes. Use on the line and wrinkled skin. Scrub is useful in deep and effective exfoliation by removing dead cells of the skin, sun tanned skin and unclog pores of the facial skin. It also nourishes and soothes the sensitive skin..